Oral B says that around 70 percent of adults over the age of 35 have lost at least one tooth, and 25 percent of people over age 74 have lost all of their original teeth! If you fall into either of those categories, dental science has made it easier than ever to overcome these dental issues and get back to enjoying your smile. Depending on your needs, budget, and current oral health there are a few different options available to you. If you have even one missing tooth, your smile could be susceptible to disease and even a shifting in the alignment of your teeth. Bridges can replace one or more missing teeth and are a good option for some people. Bridges work by using your existing teeth to support the replacement teeth. According to Oral B, there are three main types of bridges dentists can use, each suited to different situations and needs. If you properly care for your dental work, your bridge can last up to 10 years. Unlike dentures, bridges are permanently cemented in your mouth and don’t move. Your bridgework depends on the health of the nearby teeth so special care should be taken to keep all your teeth clean and healthy. In order to be fit for a bridge, the support teeth will have to be reshaped to fit the device, which is not an ideal choice for some people. Consult your dentist to find out if bridges are the right option for you. Dentures have come a long way in the past few years, and they may be the right solution for you. Dentures can replace one, several, or all of your teeth depending on your needs. Dentures are not prone to cavities like normal teeth, but they do still need to be brushed and taken care of everyday to ensure good hygiene and to preserve the life of your dentures. Your dentist can tell you the proper way to take care of your teeth and suggest denture adhesive that might help make your dentures more comfortable. Dental implants can be an expensive choice if you are missing many of your teeth. Also, if you have gum disease or a weak jawbone, dental implants are not the appropriate choice for you and you should explore your denture options. Because dental implants require some surgery, people prone to infection, pregnant women, or people with chronic illness should also choose dentures over dental implants. Dental implants are a more permanent alternative to dentures. Instead of traditional dentures, dental implants are surgically attached to your jawbone and work and feel much the same as a normal tooth. Experts say that unlike normal teeth, however, your dental implants can’t get cavities! You’ll need to still properly care for your teeth and see your dentist regularly, but your dental implants won’t need to be replaced like other dental products. With dental implants there aren’t any slipping or sliding issues that normally come with dentures. 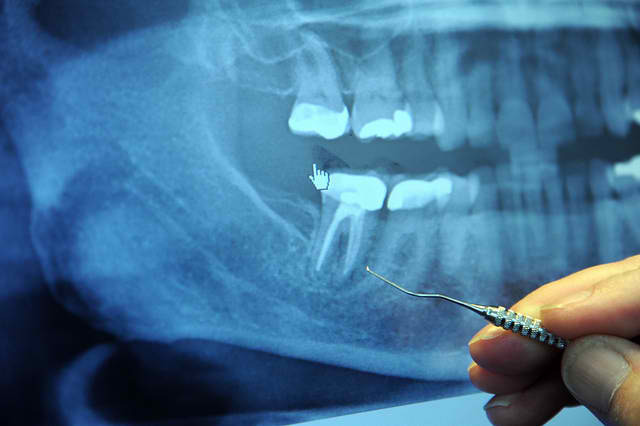 While for many, the benefits of dental implants outweigh the costs, implants can be more expensive than other options. If you have questions about dental implants, there are dental professionals that would happy to help you learn more. No matter what option you choose, it’s important that you clean your original and replacement teeth just as carefully as normal. Make sure you brush and floss daily and visit your dentist regularly in order to keep your teeth clean and make sure your mouth is adjusting to your replacement teeth. With a full smile once again, you’ll feel more confident and you’ll be able to get back to your regular life. Chris Miller is a professional writer, blogger, and English grammar enthusiast. Chris enjoys learning about new health products, procedures, and ideas. He trusts the experts at Tooth Works for his dental implants needs.